Blowout Sale! 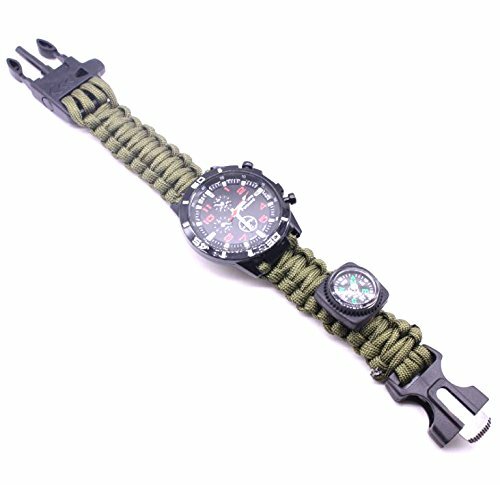 Save 68% on the BIBU Survival Survival Bracelet Watch, Survival Kits Tools with Rope, Whistle, Compass, Fire Starter, Emergency Knife, Watch for Outdoor Hiking Camping Hunting (Army Green) by BIBU at N Online Agency. MPN: BIBU-SH. Hurry! Limited time offer. Offer valid only while supplies last. HEAVY DUTY -- 550 Reflective Paracord, Made of military grade, high quality, ultra strong 7-strand 550lb paracord. Whistle, Knife and Compass are Corrosion Resistance and Anti-Aging Resistance. LONGEST CONTINUOUS LENGTH! if you are serious about survival use, you want your Paracord Bracelet to be one color so you have the longest continuous length of cord. FIRE STARTER -- High Magnesium strip inside the buckle works whether dry or wet. Be noted that there is a layer of protective coating covered on the flint rod. It is necessary to scrape it off before creating sparks. A MUST HAVE CAMPING GEAR FOR EVERY ONE: Feel Safe by keeping the Emergency Essentials in One Survival Kit. Great gift for Outdoor Adventurers, Military Personnel, Campers, Hikers, Hunters or even Constant Travelers. LIFETIME WARRANTY -- We stand behind everything we sell. Order now with peace of mind due to our Life Time Guarantee. Buy quality. If you have any questions about this product by BIBU, contact us by completing and submitting the form below. If you are looking for a specif part number, please include it with your message.